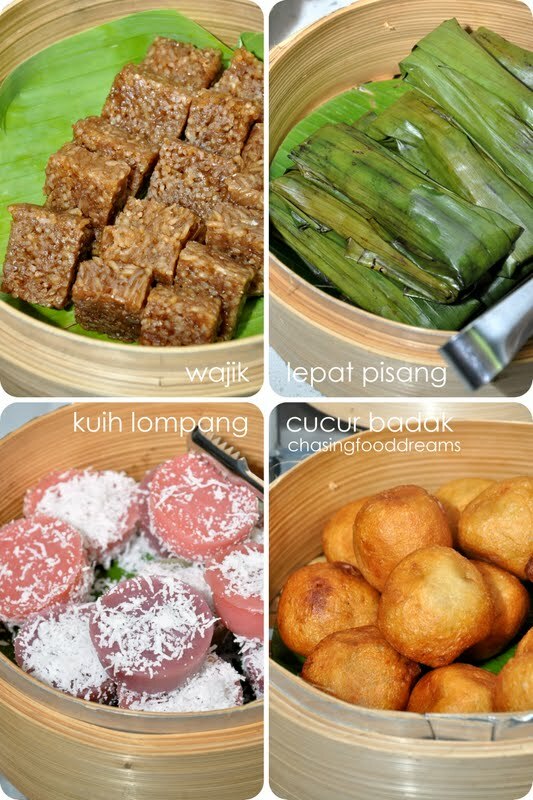 Back again at Nook at Aloft Kuala Lumpur Sentral, this round for a taste of their A-List Malaysia Feast to usher in the holy month of Ramadhan. 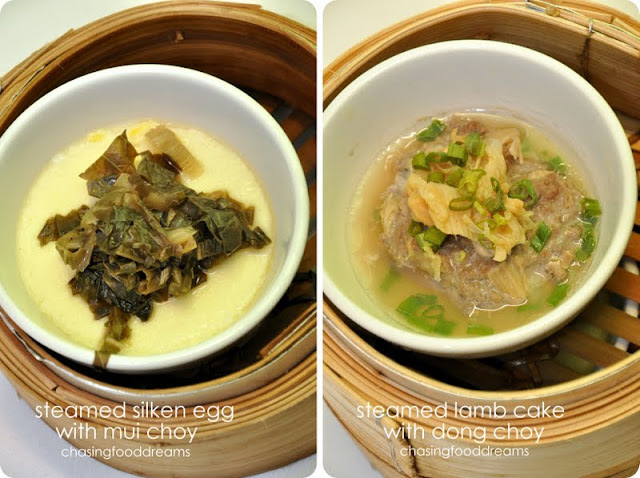 My previous visit at Nook left me craving for a piping hot bowl of their signature Sarawak Laksa and I was glad to be back now for a luscious full spread of buffet prepared by Chef Steven Seow and his kitchen team.. Walking into Nook feels good as I get familiarize with its bright and contemporary interior. It is very spacious and utterly modern, making dining at Nook very chic and retro! Hitting the counters for the A-List feast, the first stop is always the quintessential lamb… Stuffed Whole Lamb Kuzi to be exact! After all, a sight of a whole lamb well marinated, roasted and glistening beautifully under warmer lights is guaranteed to whet the appetite after a long day of fasting! The lamb is smothered in rempah, a moist wet rub, sits comfortably on a bed of Nasi Briyani and topped with condiments. Ask chef for a few slices of tender spicy lamb, heap on a few scoops of Nasi Briyani and top up with cashew nuts, fried shallot, raisin and green onions. Splash some thick curry gravy over the plate and you are set for a plethora of flavors in this plate. While we are on the grill list, there is another counter filled with loads of grilled meat and seafood. 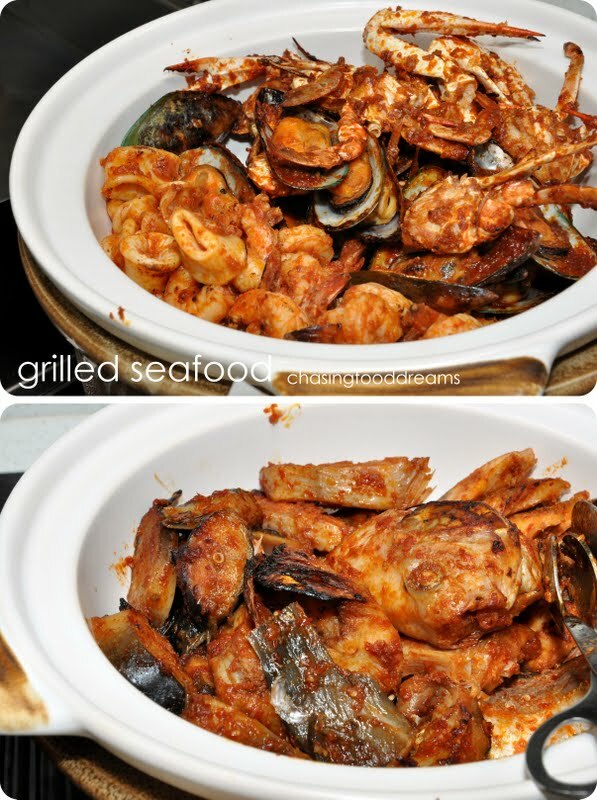 Load up with Roasted Chicken and Grilled Seafood where prawns, mussels, crabs, squid and all sort of fish are spiced up and bakar to a smoky edge. If that’s not enough, how about the ever favorite Satay, skewers of well-seasoned chicken and beef that is tender and yummy. 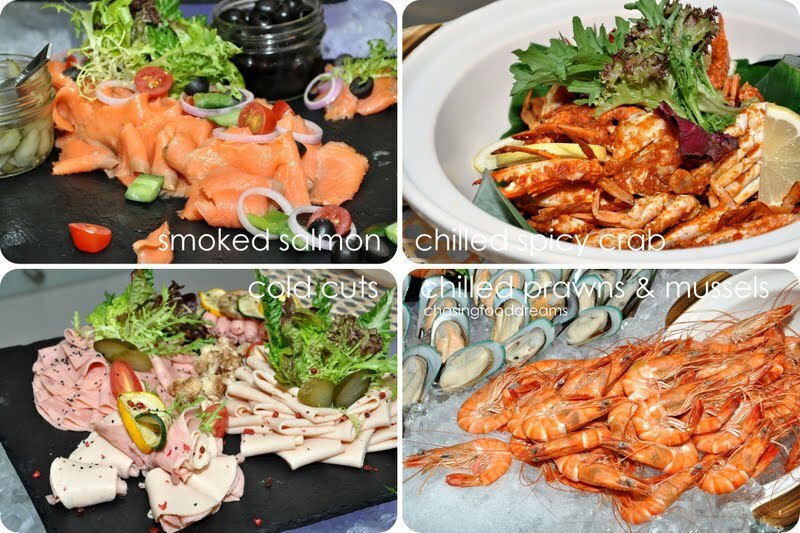 Hopping to a much beloved cold bar to start off the meal, I spied Chilled Seafood like Prawns and Mussels, Chilled Spicy Crabs, Cold Cuts and Smoked Salmon. Choices are decent and quality is good. 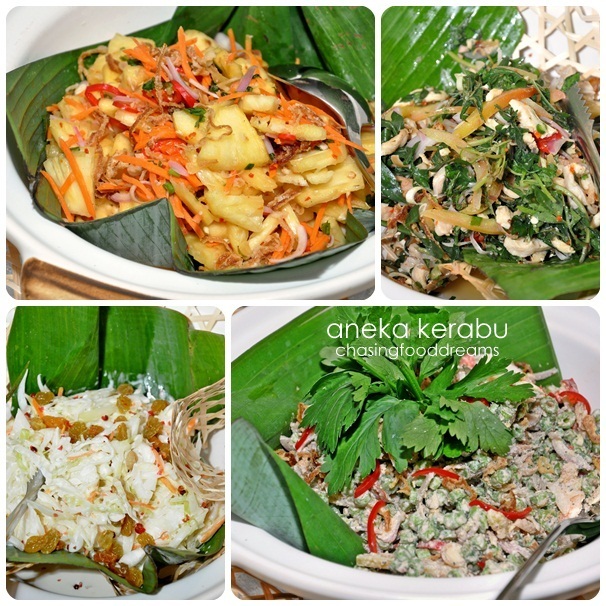 Standing alongside the chilled seafood are baskets and buckets of Kerabus, Ulams, Salads and Sambals. 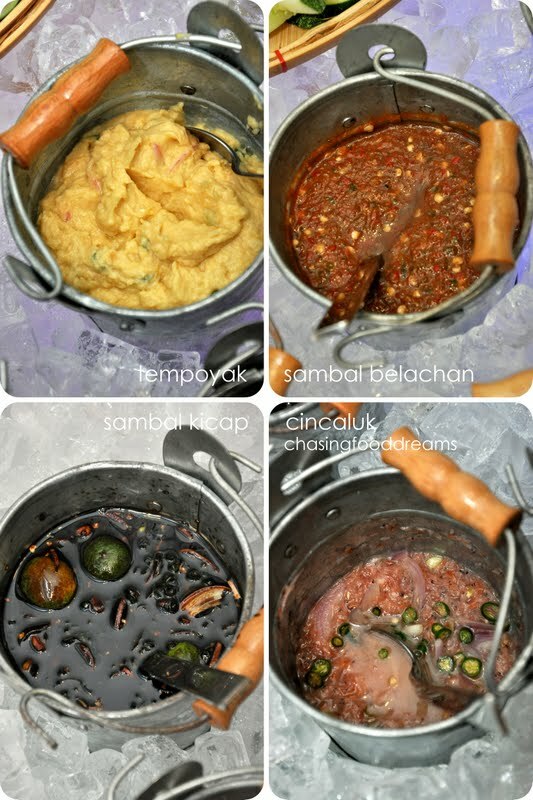 Savor crunch and raw greens with pungent Tempoyak, Sambal Belachan, Sambal Kicap and Cincaluk or go for the Acar Jelatah, Kerabu Kacang Panjang and more. There is Gado Gado too! 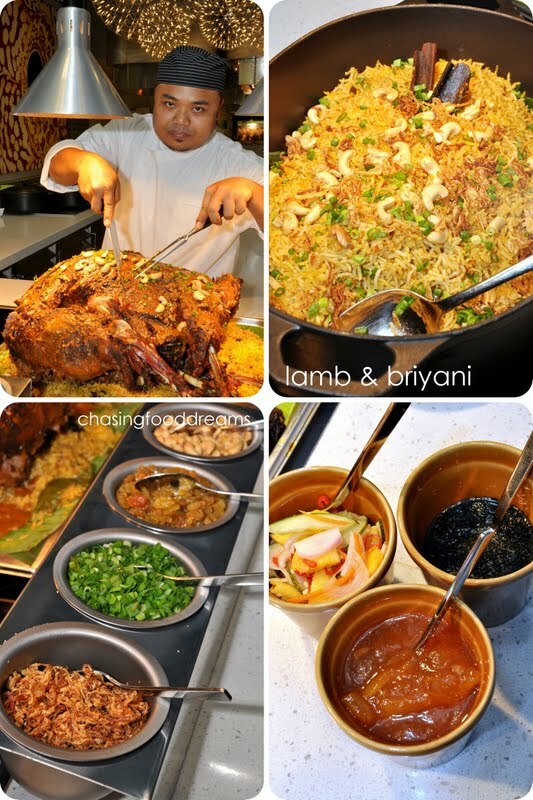 Hot buffet bar serves up dishes like Rendang Ayam, Ginger Chicken, Kurma Kentang, Honey Glazed Baked Sweet Potato to be savored with Rice Pilaf. The rendang, braised slowly for hours, are just full of spices, complex and yet simply remarkable in taste. 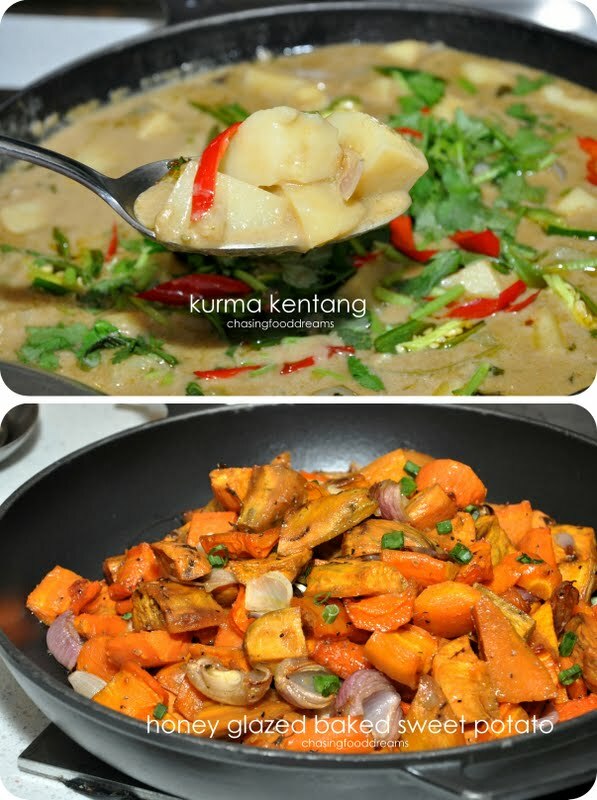 Pungent with lemongrass and chili, I found myself scraping for the thick rendang gravy. 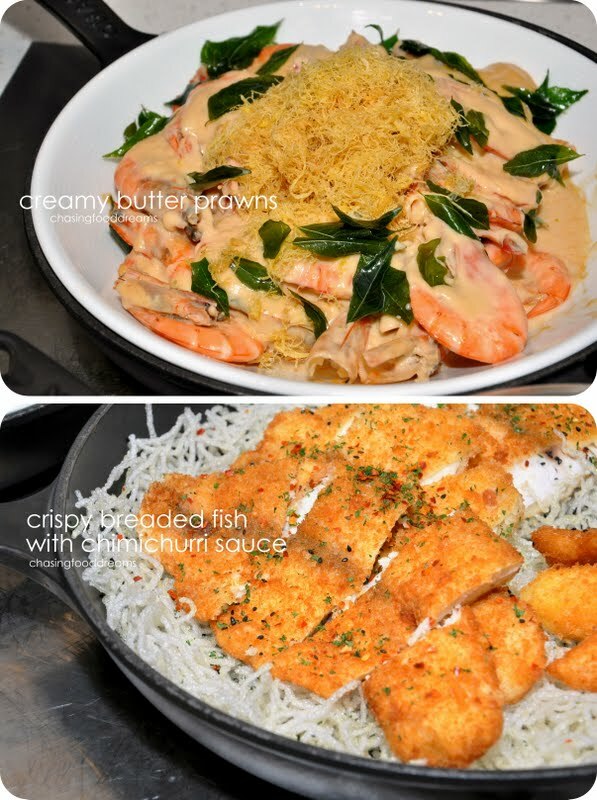 There was also creamy Butter Prawns and Crispy Breaded Fish with a creamy Chimichurri Sauce. Simple as it sounds, the crispy fish is so yummy with the pale creamy Chimichurri sauce. I went back for seconds on the fish! 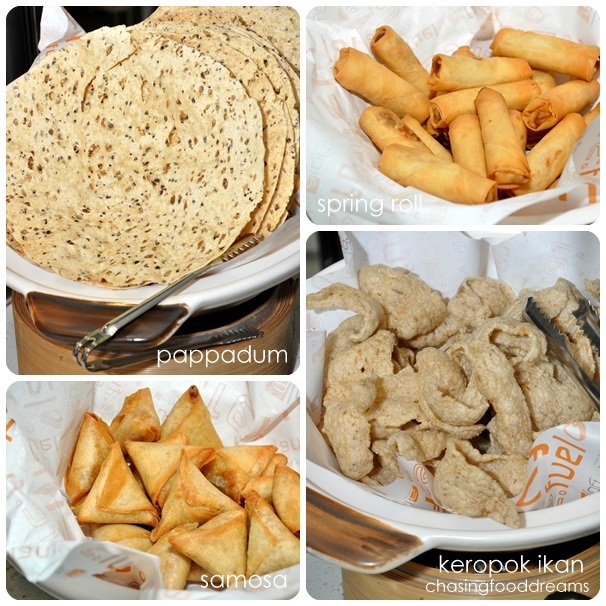 Lots of snacks and small bites like Spring Roll, Samosa, Dim Sum, Murtabak and Roti Jala are also available. Ideally, these are good because then one has more space to sample other goodies. 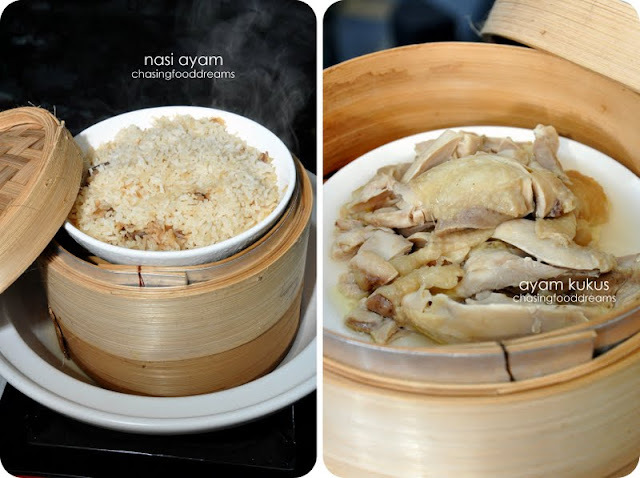 If you must have your carbohydrates, there is Steamed Chicken Rice and Bubur Lambuk while one must definitely savor the restaurant’s signature Sarawak Laksa. The version here is spicy and fairly light. 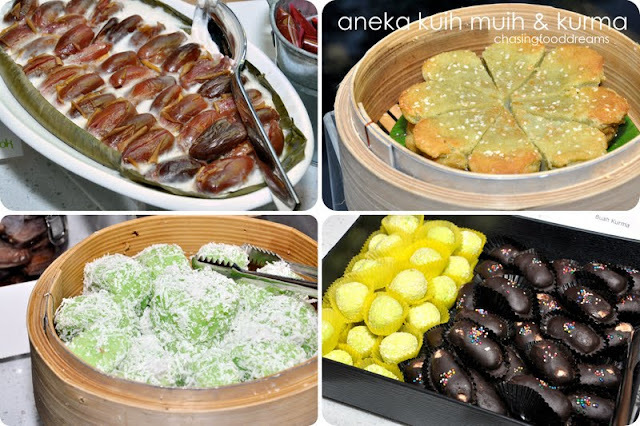 Dessert bar is decked out loads of Fresh Fruits, Mini Desserts, Cakes, local traditional Malay Kuihs, Kurma cooked in Coconut and Dodol. Hot and Cold Beverages together with Ice Kacang will make a pleasant ending. 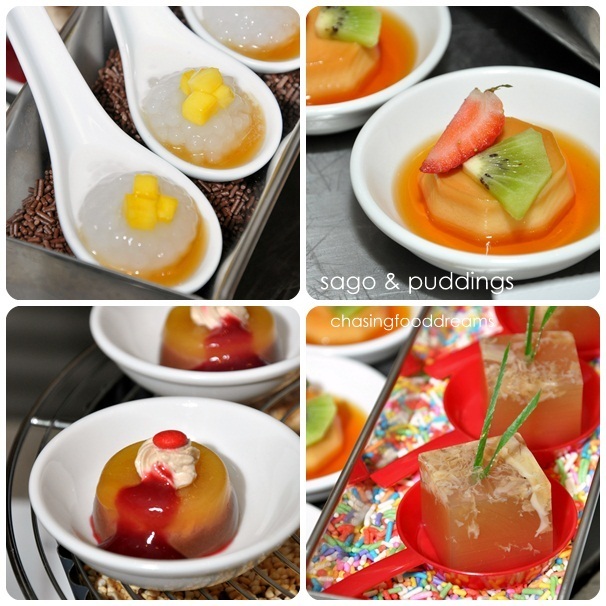 Though we should not play with our food as often told by our moms, one will be please to play at the Ice Kacang Bar at Nook with all its syringes! Book Early! 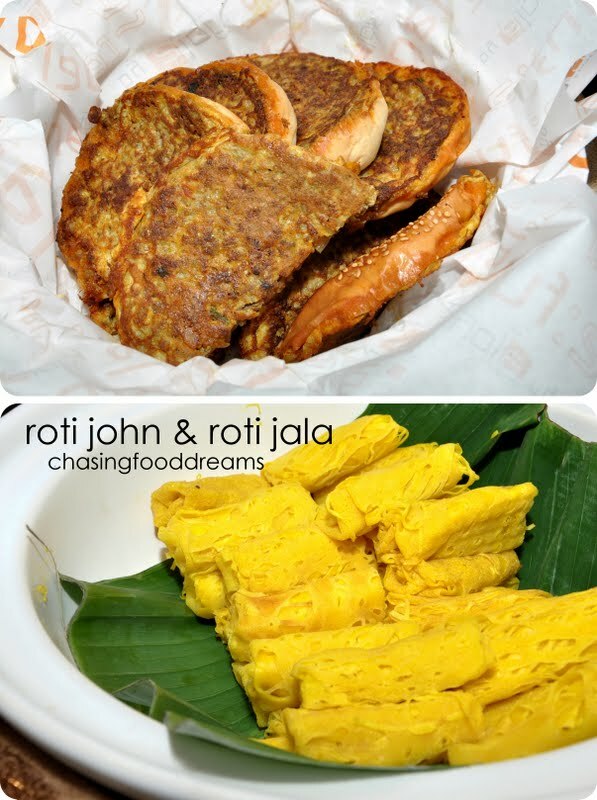 A-list Malaysian Feast Buffet is priced at RM88+ per person and early bird is available from now until 8 September at RM70nett per voucher! ada halal JAKIM ker tak?